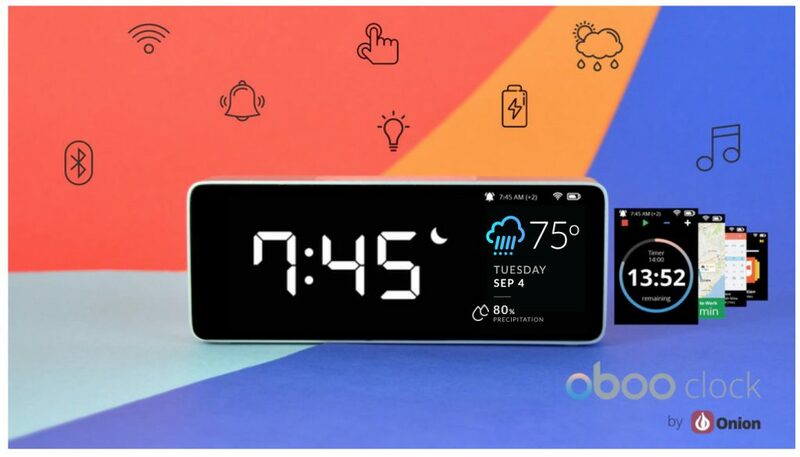 Oboo Smart Clock is an alarm clock, info center, and powerful speaker. Set as many alarms as you need. Get up to date info for your day. Play your music. Control it with gestures. Everything you need for your day is available at a glance. Oboo grabs real-time data from the internet and displays what you need to know in a series of cards. Scroll through the Weather, Calendar, Traffic, Timer, and Music cards with a wave of your hand. Oboo is always connected thanks to its built-in WiFi. That’s how it can get the most up to date weather and traffic data from trusted online sources as well as grab events from your calendar. You can use the Oboo app to control your clock from anywhere and everywhere. 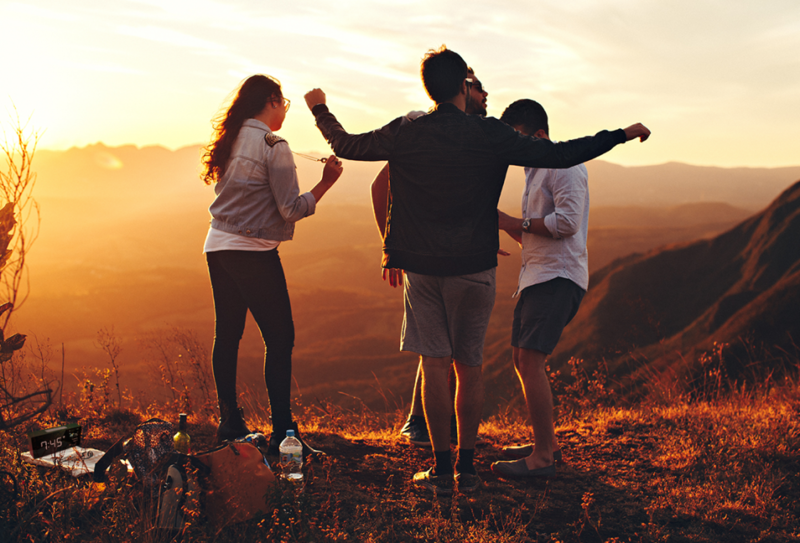 Wirelessly connect your smartphone, tablet, or other Bluetooth-enabled device within a 50-foot range to stream your favorite tunes on Oboo’s high quality speakers. The built-in battery makes your Oboo a 100% portable, totally wireless speaker. Oboo dims its display when it’s time for bed so you can get the restful sleep that you need. Hidden inside is an ambient light sensor that monitors the levels of light in the room, allowing Oboo to know when the display needs to shine bright to be readable and when it needs to be dim. Will the time reset after a power outage? We put a lot of thought into the time keeping part of the clock design. We wanted to create a clock that never has to be adjusted after the initial setup. The time keeping portion of the design is backed up by a dedicated built-in coin cell battery. This small battery will keep the time accurate even if Oboo’s battery runs dry. On top of the coin cell battery, Oboo Clock will use the internet to sync its internal time every time it powers up and periodically throughout its operation. This ensures the time is always accurate. How do I choose the color of my Oboo Smart Clock? After selecting your Oboo Smart Clock model, you will be presented with a drop down box where you can select your color option. You can increase the number of Oboo Clock units you want to order on this same page. How do I update my shipping address if I move? On the bottom of this site go to: My Account and then Addresses on the page that opens. Click on the edit icon beside shipping address. Before we ship out your Oboo Clock we will double check your profile shipping address and the shipping address used on your order. If we find a mismatch we will email you to confirm before we ship. Do I need to pay a subscription fee to use Oboo? No, there are no subscription fees associated with owning or using the Oboo Smart Clock. Are there taxes on the Oboo? There are no additional taxes charged on top of your order. However, there may be import duties or custom fees you must pay when receiving your package. This is determined by your country’s customs office and the payment of these charges are the responsibility of the recipient. Does Oboo support my WiFi network? Yes, Oboo fully supports 2.4GHz WiFi b/g/n networks with open security and networks secured with WPA2 or WPA1 encryption. These are the most common configurations for home WiFi routers. Can I wirelessly charge my Oboo Smart Clock? The Oboo Clock is charged with the included DC power supply that plugs into the back of the device. The wireless charging pad that comes with the Oboo Smart Clock+ is meant to charge your smartphone, not the Oboo Clock itself.